Ovila Abbey Tripel | Sierra Nevada Brewing Co.
From a 32 oz growler at TBG into a tulip glass. First pour. A - Hazy, yellowish gold with a one finger fluffy head that dissapates quickly to a thin lace. S - Belgian yeast notes, clove and spices. T - In line with nose, some muted mild sweet notes and wheat, no noticeable heat. Grape, vinous notes more noticeable on the 2nd pour. M - Low carbonation, medium feel, semi-dry finish. A little sticky. 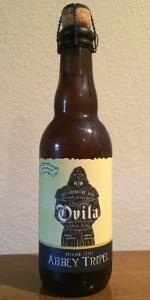 "Ovila Abbey Tripel's golden color and brillian foam hide an incredible depth of flavor. It maintains a perfect balance between slightly sweet and bready malts, floral hop notes, and the fruity aromatics of a traditional Belgian yeast. Tripels were first created by Belgian monks, and this beer is our homage to the original blonde abbey ale." Brewed in the style of a Belgian Tripel Ale, available in 12.7 oz bottled 4 packs and on limited draft. One-time offering under the Sierra Nevada Ovila label. Poured from a 12.7 oz bottle to a tulip glass. Taken from notes from last year's craft expo. Look : Dark amber, 20% opacity, 2 finger head. Smell : Banana, yeast, plum, wheat, blood orange. Taste : Lots of yeast out front, with a hop bite and wheat. Blood orange and Banana finish with more dry yeast. Alcoholic bite. Feel : Light to medium bodied, creamy, semi-dry. Ends semi-dry with yeast character. Overall : Good Tripel with yeasty overtones and mild fruit backbone, namely blood orange and banana. pours a hazy straw-amber with medium soapy head. nose; pear juice and pulp. taste; toasty malt, pear & apple juice, honeyed biscuit, mild hops and a touch of spicy peppercorn. strong honey & biscuit notes on the aftertaste. most notably, the belgian yeast properties are absent. the 8.8% abv is almost totally under the radar here. this is certainly not a tripel proper, but as the bottle states, "an homage to the style", being much more fruit-dense and sweeter. Pours a clear orange color with a small fizzy white foam head the immediately recedes, leaving absolutely no lacing. Aroma of coriander, clove, and yeast. Taste of bready malts, yeast, clove, pepper and saltines. Although the taste is fine and all the flavors work well together, there's not much going on here to differentiate this beer or take it to the next level. Light body with moderate carbonation. Absolutely no bite from the nearly 9% alcohol, which was quite impressive. This is the definition of a sneaky beer. Crisp and refreshing finish. Overall, it is clear SN is out of their element here. It's not bad, but there's always a little extra "oomph" that separates the decent/good beers from the great beers, and this beer is definitely missing that oomph. Look: Clear amber-gold ale, thin head with zero tracing. Taste: The spicy-sweet notes in the nose come through on the palate. Not much alcoholic heat despite the nearly 9% ABV. Overall: Not bad, but somehow neutered. The Belgians still rule this style. Ovila Abbey Tripel from Sierra Nevada Brewing Co.